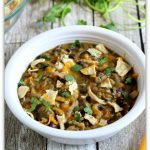 Lentils and chicken are slow cooked with green salsa and black beans to make a creamy one pot dinner. Top it with cheddar, sour cream, cilantro and crunched up tortilla chips for the ultimate Mexican meal. Place lentils in the bottom of the slow cooker. Pour the broth over the top. Add in the frozen chicken. Top the chicken with the cumin, salt, garlic powder, chili powder, salsa verde and black beans. Cover and cook on LOW for about 6 hours or until lentils are tender. Remove the chicken and place on a cutting board. Shred the chicken or cut into bite size pieces. Add the chicken back into the slow cooker. If it needs to be thickened, stir 1 Tbsp of cornstarch together with 1 Tbsp of water until smooth in a little bowl. Stir into the slow cooker and cook on high without the lid for a few minutes until it thickens. Add cheese into the slow cooker. Serve lentils and chicken plain, in tortillas, as a dip with tortilla chips, or put it over rice or even quinoa. Top with tortilla chips, cilantro and sour cream.